Tunisia PM pushes broad reform package, talks with unions. - The Maghreb Times ! Home Maghreb Tunisia PM pushes broad reform package, talks with unions. Tunisia’s prime minister plans key talks with unions to hold down state sector wages and sees close to 3 percent economic growth next year from a package of reforms aimed at underpinning the democracy won in the 2011 revolution with economic gains. Opportunities and jobs are a constant demand by younger Tunisians frustrated that economic progress has not matched the political transition to democracy since the uprising that ousted autocrat Zine El-Abidine Ben Ali as president. Western backers often praise Tunisia as a model of success for a region mired in violence. But successive governments since 2011 have failed to create jobs or carry out reductions in the public deficit demanded by their international lenders. It is a delicate balance for the government. Austerity measures like a vehicle tax proposed in 2014 or lack of jobs in the past have triggered the kind of protests among young Tunisians that helped topple Ben Ali and there were riots over jobs in the south at the start of this year. Youssef Chahed, a French-educated agriculture specialist in office less than a month, is sensitive to how fragile the social peace is in Tunisia but expressed confidence that he could deliver on reforms with his new national unity government. “All reforms are sensitive but we are going to resolve everything through dialogue and consensus,” Chahed told Reuters in an interview. He said his government would first stabilize the public deficit, including bringing under control the large public wage bill, and focus on creating new revenue. He said a four-year plan estimated average growth at around 2.5 percent. Growth last year was 0.8 percent after three big Islamist militant attacks battered the vital tourism industry. The deficit this year would widen to 6.5 percent compared with 4.4 percent last year. “For 2017, growth will be close to 3 percent,” he said. Tunisia faces a debt service payment of $3 billion next year, and the central bank has warned the government may struggle to come up with the $450 million a month it needs to pay public employees. The public wage sector represents a huge portion of Tunisia’s public spending. At 13.5 percent of GDP, it is one of the highest in the world, a remnant of the system of high state employment and subsidies from the Ben Ali era. But how successful curbing or controlling public wages will be depends on negotiations with the powerful UGTT and UTICA labor unions on whether they will allow a freeze in wage increases and in public sector recruitment. Earlier this year, the IMF approved a $2.9 billion four-year loan for Tunisia, one of a raft of foreign credits and loans from partners hoping to support the transition, But the IMF has urged acceleration of reforms. “We have a complete package to stabilize the budget – an extraordinary tax for companies (and) calling on the UGTT to freeze salary increases. The idea is to get an agreement on a complete policy for growth,” Chahed said. 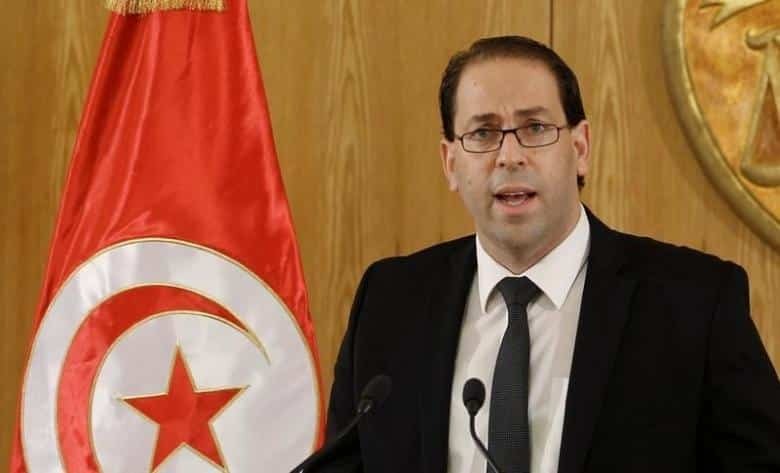 When he was picked for the top government job by President Beji Caid Essebsi in August, critics dismissed Chahed as a political novice chosen only for his loyalty. Critics said he would be unable to manage resistance to any austerity reforms. But Chahed, in the interview, said he believed the government’s policy of inclusiveness – bringing in major parties and representatives close to the unions – would help towards a consensus on pushing through tough measures. Those measures, include reducing tax evasion and incorporating the informal, non-taxed businesses into the tax-paying economy. A new tax on companies is also in the works. Reviving economic revenue in vital industries will also be part of the government strategy. Tourism, which represents around 8 percent of GDP, has been hit by lost bookings and hotel closures after the attacks on foreign visitors last year. But Chahed said the sector was slowly recovering, citing the lifting of a travel ban by Spain, strong Russian and Algerian visitor numbers as a signal of confidence in Tunisia. Under Chahed, Tunisia resolved two protests that were costing millions in losses. He had promised a tough line with economic protests over jobs in vital sectors, but in both cases the government reached a financial deal with protesters. In the phosphate sector – a key revenue earner — the government this month signed a deal to create nearly 3,000 jobs in exchange for ending protests and restarting vital phosphate output and exports. Previous articleWithout jobs, Tunisia’s shining revolution begins to dim. Next articleEgypt, Tunisia cooperating to develop sports in both countries: Tunisian ambassador to Cairo.